I've been working on collecting data on used Paiste 602s and Sound Creation sales for over a decade. This is to build up a freely available database as part of a research project in statistical methodology. As a nice spinoff I've got 2,600 sales records (and counting), mostly from eBay but from other places as well. Below I've presented a few analyses in a simple format which you can use for figuring out the expected price of most of the different models. Along the way I've also collected weights for as many as I can. All of this data is freely available in spreadsheet form so you can look at whatever takes your fancy. I'm also happy to do special retrievals or analysis for you on request. I used to believe the there was just one sort of 602 stamp, and the variation we saw might just be due to how the stamp was pressed in, or wearing out over time. But having come back to 602 matters after doing a lot of detailed work on Avedis Zildjian stamps, I took a fresh look. In April 2015 I saw the three variants and wondered why I hadn't noticed them before. This version is the most common form in my collection of reference pics. I'm going to call it the Solid Form. 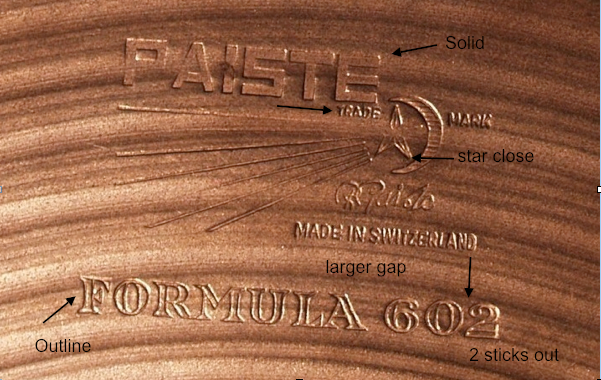 Solid letters are used for both the PAISTE and the FORMULA 602. This second version has the solid letters for Paiste, but an outline font for Formula 602. I'm going to call this the Mixed Form. 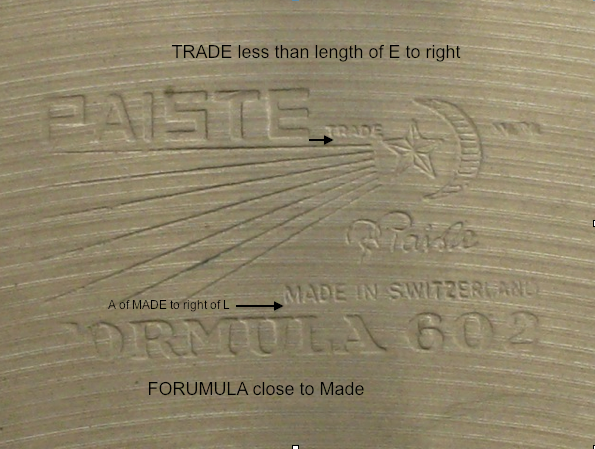 You can also tell it is a different die stamp from the Solid Form because the position of Trade is under the E of Paiste. In the Solid version, the Trade is to the right of the E of Paiste. In addition the vertical distance between the Made in Switzerland and the Formula 602 is different in the two stamps. There is a larger gap in the Solid form of the stamp. The points of the star are also closer to the moon in this mixed version. The 602 also extends beyond the end of Switzerland in this mixed version. In the Solid and Outline versions the 602 and the Switzerland end at the same place (going left to right). This third version has the outline font used for both Paiste and Formula 602. You can also tell this stamp is different because Trade is further to the right of the E of Paiste than it is in the first All Solid stamp. In the Solid version the word Trade is half the length of the E of Paiste away. In this Outline version it is more like the full width of the E away. Unfortunately I wasn't recording these three stamp variants for many years of data entry because I didn't know they existed. Since I've noticed I've recorded the details and have some preliminary info about the correlation with pre vs post serial numbers, the initial digit (aka year) when a serial number is present, and presence/absence of black ink logos, and what color the model ink is (if present), etc. I'll add this soon, but I wanted to get the images and formal descriptions in place first. 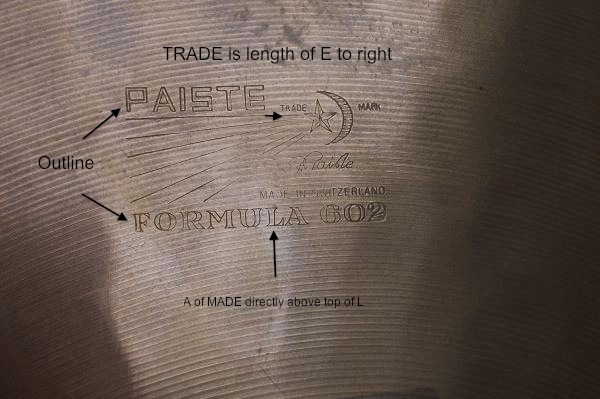 Further info on all things Paiste (except any pricing info for now) can be found at the Cymbal Wiki Paiste Page. This is a project which is underway to reconstruct all the lost info in the Paiste-Only Wiki which went dark some time ago. Not everything is back yet, but I recommend you go there to follow up on serial numbers and when ink logos changed. The link I've just given goes to the main Paiste entry. Here is the specific Serial Numbers entry. I see I need to give a bit more detail about the coding I've used (eg Sound Creations come in Early, Late, and New Dimensions -- but how do you know what these are if you are new to the game?) and I'll get to that after the reconstruction of the lost Wiki info. At that time I'll integrate all my additional research plus all my pricing information and more. But patience is called for. A team of dedicated volunteers is working on getting the info back. Thank you all. zenstat aka Steve Black, PhD -- retired statistician and general gatherer of information about cymbals.